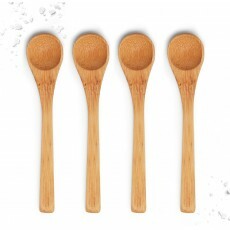 This sustainably harvested bamboo spoon is the perfect size to complement our salt jars. The spoon fits easily into the neck of our jars and holds just the right amount of salt. Price is for one spoon. Dishwasher safe. Measures 3-1/2” long. © 2019 Amagansett Sea Salt Co.